A diaper bag is one thing that parents of an infant always bring when out of the home. As part of our preparedness planning, my wife and I decided to upgrade our baby’s diaper bag to a fully-fledged bug-out bag. The reason for this is that since we’re carrying an extra bag anyway, we might as well include some items needed for a baby’s emergency kit. The bag hangs off our stroller so the added weight isn’t any real inconvenience. Nappy wipes. This is essential for when there is not enough water to wash with. It’s better to save clean water for drinking. Baby’s favourite toy or security blanket. This will help to amuse and lift baby’s spirits, which can also provide a much-needed mood boost for us parents. Next article: Do you live in one of Manila’s flood-prone areas? – add a space blanket. 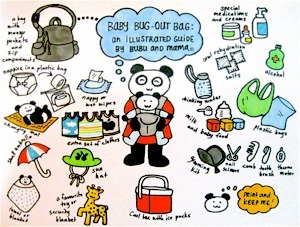 – pack your baby needs in 2-3 set in case one of them gets wet, you still have a dry one to use. You can also buy anti-mosquito patches for children.